Hiking guide in Croatia - Explore Croatia Become a Patron! Even though Croatia is not blessed with the glistening alpine peak with everlasting ice and snow, but it still has a long hiking tradition. Hiking is arguably the most popular outdoor recreation in the country. There is an excellent and marked network of trails and mountain huts and shelters, even though the latter is very basic. Preserved nature and breathtaking views from the coastal mountains will more than enough offset this minimalism. Where to hike in Croatia? 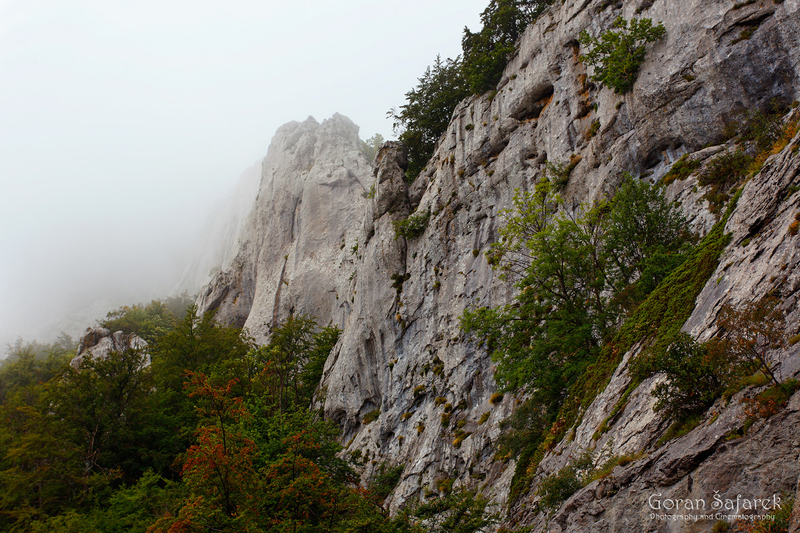 Most of the mountains of Croatia are parts of the Dinaric range, characterized by limestone rock. Weathering has made this rock porous, as calcite is partly soluble in the water. This results with a porous rock called karst (krš in Croatian) that hardly keeps the water on the surface. The scarcity of the water is a big problem, and there are just a few rivers, but where they are, sometimes they are oases in the almost lifeless barren landscape. Then, there are no high peaks, and the highest summit in Croatia is Sinjal on Mount Dinara (near Knin), with the altitude of 1831 meters. These two facts, the porous rock, and relatively low altitudes are the reasons that there are no alpine landscapes, but Dinarics are not uninteresting. Quite contrary. 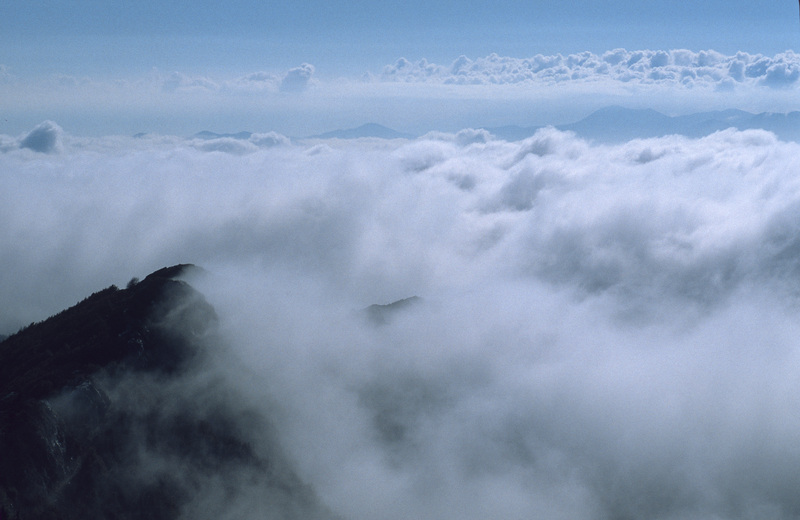 The charm lays in microrelief, ruggedness, and wilderness of these mountains. The lynx, bear and the wolf are living proof for that. Continental hills and mountains are more rare, even lower and jutting like islands in the plains. They are usually older, with more crystalline rocks (metamorphic and volcanic). Low altitudes mean less extreme situation, even though coastal mountains could be very harsh, due to the high humidity and snowfall and strong bora wind. So, the gear is standard, even in the winter. There is little need for technical climbing and corresponding equipment. 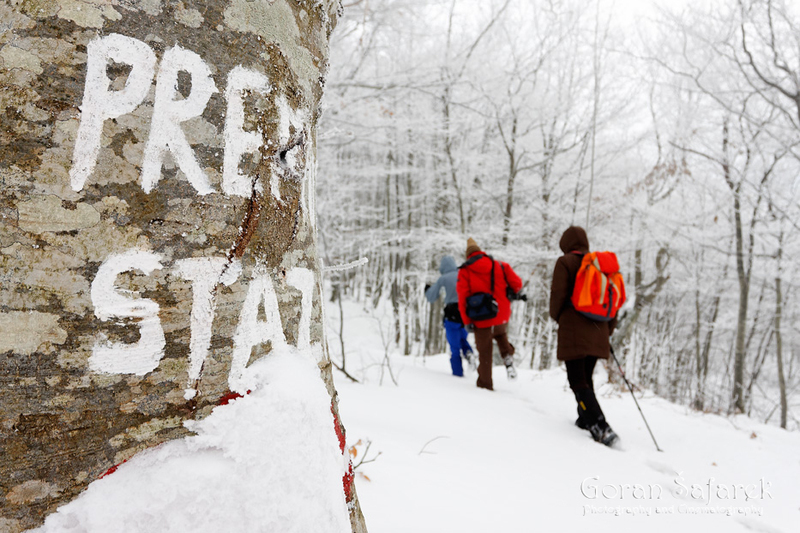 In winter, we advise crampons in exposed coastal mountains like Velebit, due to the ice. Adriatic facing slopes experience cycles of the day melting and night freezing, so thick crust of ice is formed. Some summits like Sveto brdo also demand an ice pick. 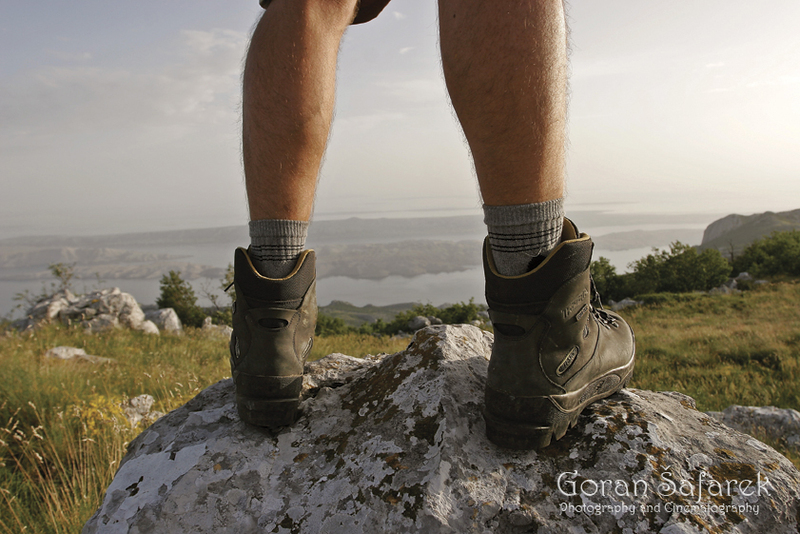 The hiking in Croatia is easy, doesn’t demand technical knowledge, only in rare cases. Mountains however still take its toll in lives, so care, and prudence should always be exercised. There were many cases when Croatian Mountain Rescue Service (HGSS, Gorska služba spašavanja) saved people with helicopters, only to find out that they had flip flops, shorts, and t-shirts. In the emergency, call 112. They are not the only operative on mountains, but also on rivers and other outdoor locations. 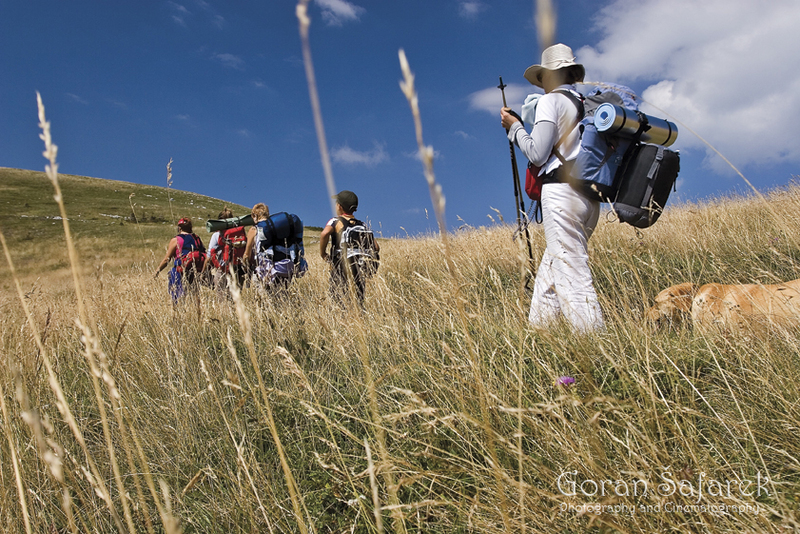 It is possible to hike in all seasons, but most of the foreign tourists come in the summer. This is the aridest period in the region with little water sources. As it is the case almost everywhere, the late spring (June) and late summer (September) is the best. 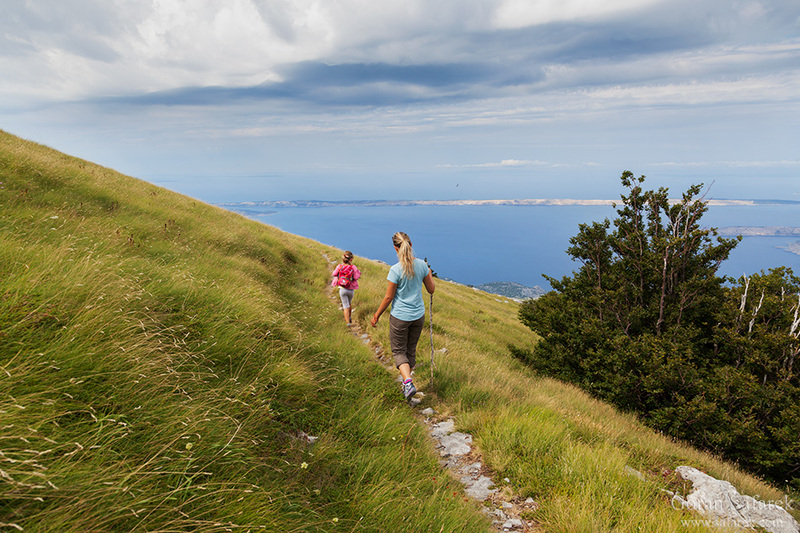 Hiking in mountains doesn’t cost a lot in Croatia. If you hike in protected areas like Sjeverni Velebit NP or Paklenica NP, you have to pay the ticket. Lodging is accessible, with many mountain huts and shelters. The price for a mountain hut is from 70-100kn. 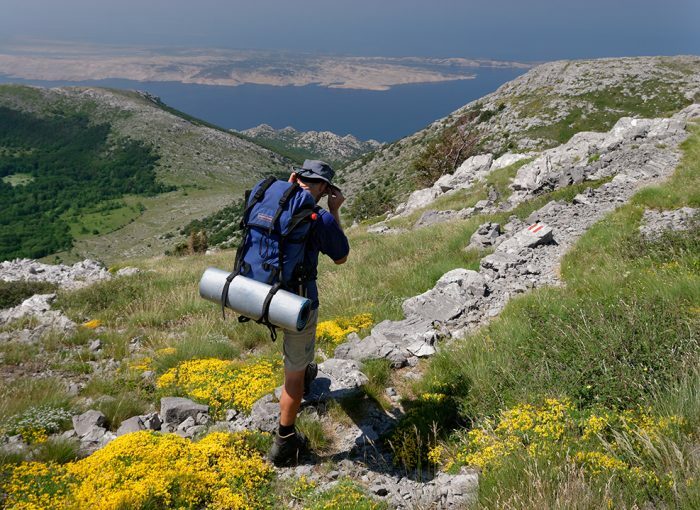 Members of Croatian hiking society pay half the price. The shelter is free to use but usually very basic. Gorski kotar is the mountainous region in western Croatia, sandwiched by Kvarner bay of the Adriatic, Slovenia (and the Kupa River) and highland Lika. Delnice is the biggest town. Even though laying on the karst rocks, it is a forested region, thanks to the copious rains and snow. 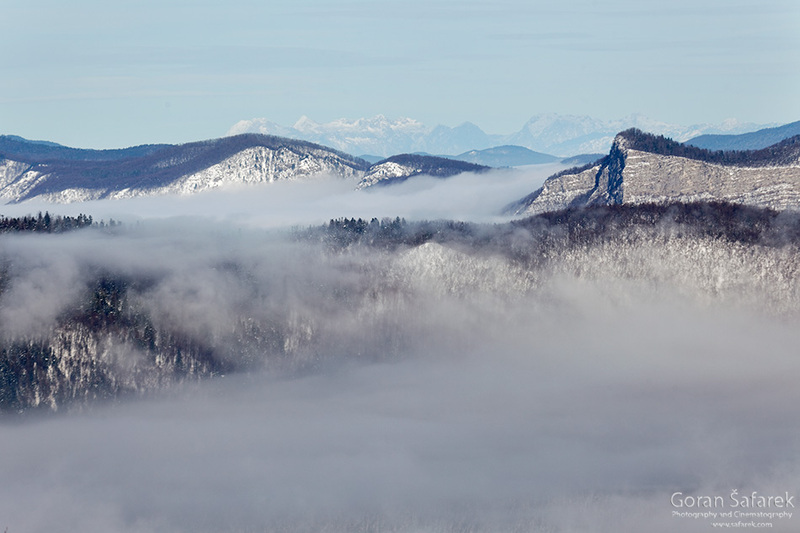 There are few rocky peaks and an open area; the highest summit is Risnjak (1528) in the national park of the same name. Risnjak is a popular destination, with a good mountain hut and views on all sides, even to the Alps. It is possible to approach it from two directions – longer from Crni Lug near Delnice, also the national park entrance and the bit shorter from Gornje Jelenje on the other side, from the old Zagreb – Rijeka road. In the winter, one room is always open and serves as a shelter with a stove. Snježnik is a good one day trip, but mountain hut is in ruins, so it’s not possible to stay overnight. Down the old Zagreb – Rijeka road is Platak, also the popular destination that serves n winter as a ski resort. The good mountain hut is a base for higher mountains above Rijeka (Obruč). They are pretty open, with grasslands and with beautiful views to the northern Adriatic coast. Bijele stijene and Samarske stijene, on the eastern edge of Gorski kotar are also very popular for hiking. Forces of nature have eroded the limestone peaks, leaving the gleaming white towers that jut from the forest. These mountains are the exceptionally wild place, with almost no human infrastructure in sight. No wonder it is protected as a special reserve. The good network of trails interconnects the rocks, sometimes in a very harsh environment. You can climb above the towers or in cold and shady basement where you can still find the snow! There is a dm on Bijele stijene and also a shelter, while on Samarske stijene is a small shelter, beautifully built in the big crevice of the rock. There is also a shelter on Burni Bitoraj, a promontory near Fužine. Učka is a 1401 tall mountain above Opatija Riviera. The mountain itself is not very interesting or demanding, but apparently, it offers excellent views on Kvarner. Also, the proximity from major coastal tourist destinations in Istra and Kvarner makes it easy one day hike. The highest peak is. 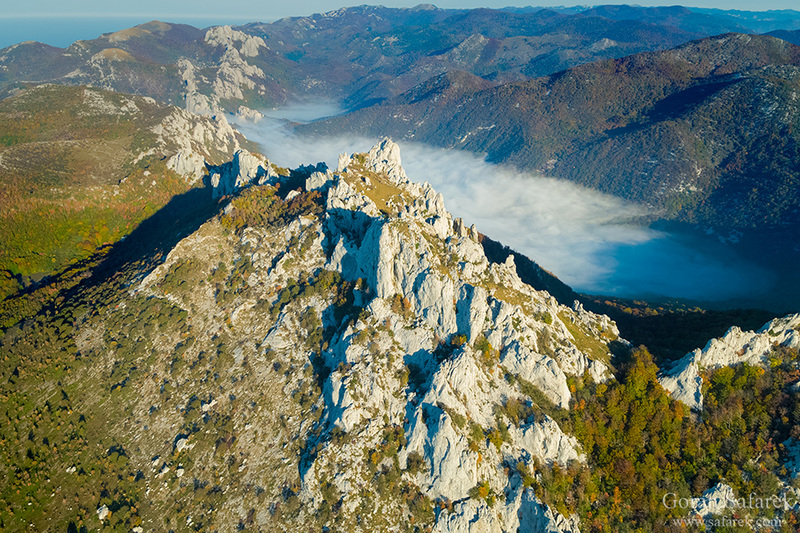 Velebit is undoubtedly the most exciting mountain for hiking. Nothing can match the landscapes, views on Adriatic, diverse habitats and wilderness. Good network of marked trails connects almost all interesting peaks, and there are many mountain huts and shelter to spend the night. The hiking center of the northern Velebit is Zavižan – mountain hut and meteorological station, run by now famous Ante Vukušić. It can be reached by foot from several directions (Krasno from the highland Lika, the coast and Oltari, the closest starting point), also by a car from Krasno. There are striking views to almost all directions. There is a small botanical garden where you can glimpse the botanical richness of the mountain, which includes several endemic species. Zavižan is the starting point (or ending J) of well known Premužić Trail. As there are virtually no steep ascents, it’s suitable for inexperienced hikers too, offering grand vistas on the striking rocky summits and the coastline. This trail is 57 kilometers long, and you can walk it in 3 or 4 days. We recommend four, the optimum of walking and enjoying time: 1 day Zavižan – Rossi shelter; 2 day Rossi shelter Alan dom; 3 day Alan dom – Ograđenica shelter – Baške Oštarije village with several options for accommodation (we recommend new hostel). First two days are shorter, but more exciting and deserve more time. 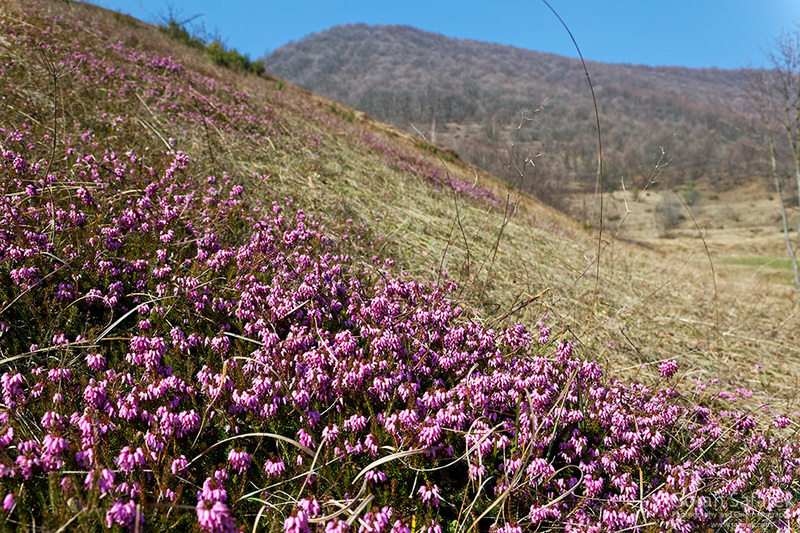 On the way are incredibly craggy Hajdučki and Rožanski kukovi, vast meadows and thick forests. Keep in mind that there is no water in shelters, so fill it up in mountain huts. There are several more side branches or loops; one notable is from Rossi shelter to picturesque Lubenovac valley and nearby Veliki Kozjak summit. Just before Baške Oštarije, don’t miss spectacular Dabarski kukovi, a range of towering eroded rocks, like a skeleton of long-dead Godzilla! You will need one day to hike through them comfortably. Bačića kuk, one of Dabarski kukovi is a climbing destination. Between Baške Oštarije and South Velebit, there are less interesting peaks and trails. 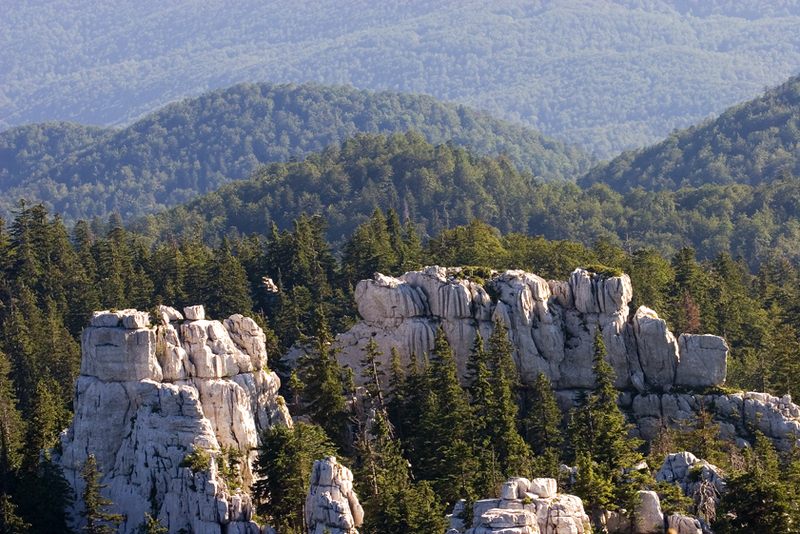 South Velebit is the highest part of the mountain range, with Vaganski vrh and Sveto brdo (1757m). This is the only alpine looking mountain landscape in Croatia, with extensive grasslands. Several shelters make a possible prolonged stay. The link with Adriatic is Paklenica National Park, with the splendid canyon, carved from the mountain by the only permanent stream. 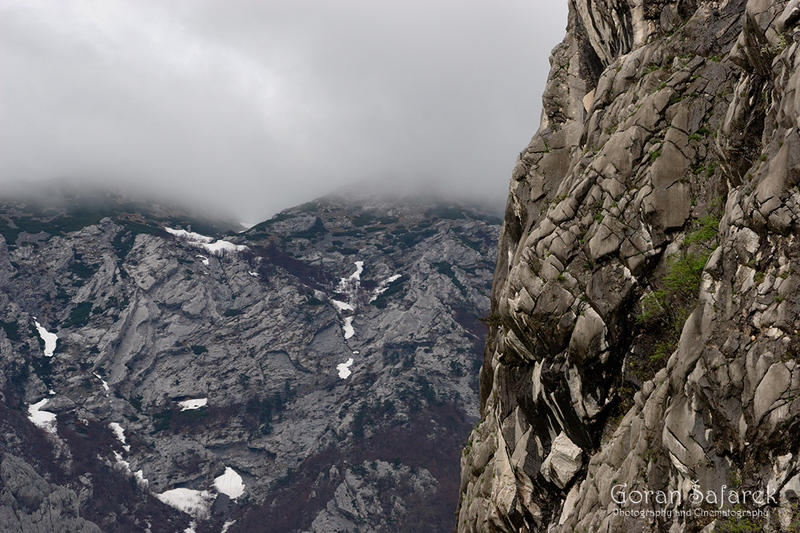 Big monolith rock, especially Anića kuk, more than 300 m tall is perfect for climbing. The stream also called Paklenica (like the canyon itself) cascades down through countless rapids and small waterfalls, sometimes through giant boulders. A mountain trail follows the stream from the mouth to the sea until the highest peak. On the upper part of the canyon is a good mountain hut as a base. There is also parallel canyon called Mala (Small) Paklenica, geographically more extreme and with less water. On the very southeast edge, there are interesting places like Tulove grede, towering spires that are visible from the considerable distance. 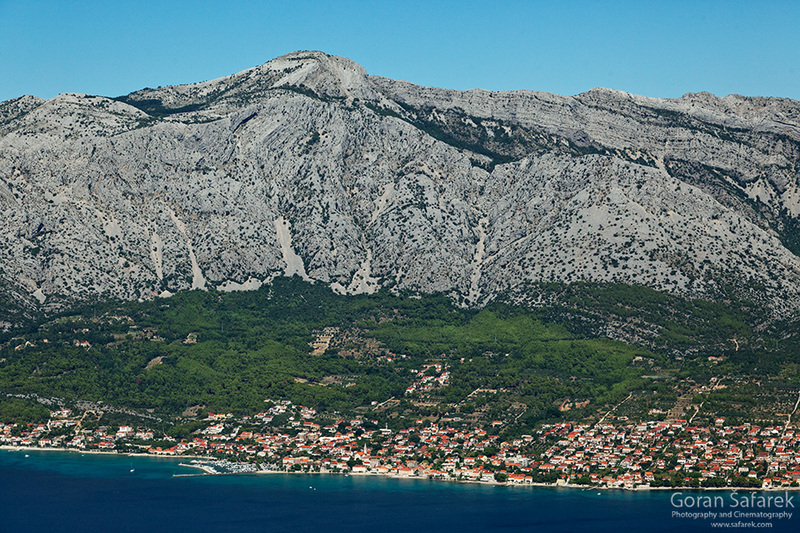 Biokovo is a mountain that looms over Makarska Riviera, protected as a nature park. This barren, almost vertical cliffs look like they will topple any moment, but fear not – they hold for millions of years. This is the world of grasslands, caves, scattered woods, and mostly karst rocks. Biokovo is the kingdom of the chamois. The summer if the time of big heat, so plan your trips carefully. The best time is spring and autumn. Biokovo is not so popular for hikers, but still offers amazing views on the coast. For beginners, there is a mountain road that connects good part of the mountain, until the summit 1762. Then, there are trails that start at the sea level and climb directly to the top. Vošac is a small mountain hut that overlooks Makarska. Dalmatian mountains are a string of other Dinara is the highest mountain in Croatia, with Sinjal peak of 1831 altitude. These mountains are not recommended for the summer hiking, as there are almost no shade and water. The same applies to other Dalmatian mountains. Omiška Dinara overhangs Omiš, Mosor is above Split. Islands mountains are not as big but could be very attractive, offering great views and day trips. St. Ilija on Pelješac (technically not an island, but peninsula with a very thin land strip at Ston), is the highest peak. It towers above Orebić. It is possible to go from the town or take a car and shorten the trip a little bit. As usual, begin your hike as early as possible. Osorčica on Mali Lošinj, also near Cres is another impressive sight and hike. Not as impressive as on the coast and immediate hinterland, Hiking in continental Croatia still offers some nice hikes. Medvednica above Zagreb is an obvious choice. Nearby Samobor, small, but very charming town is a hiking hub for numerous trails and peaks. Samoborsko gorje, hills around the town are mosaic of forests and nice meadows, small villages, and vineyards. Good mountain huts are places to eat and spend a good time. Papuk in eastern Croatia is another good trip, mostly forested, but Jankovac offers a lake and impressive waterfall, together with restaurant and cozy mountain hut.